Petition handed to Adidas: No fair play on stolen land! On Friday 22nd June, a delegation of docP (the Services and Research Centre on Palestine) launched the kick-off of a worldwide BDS campaign calling for the immediate ending of Adidas’ sponsoring of the Israeli Football Association (IFA). IFA is facilitating football matches in illegal settlements in the occupied territories of the Palestinian West Bank. These illegal settlements are seen as war crimes according to international law and constitute a major obstacle to peace between Israel and the Palestinians. The construction, expansion and maintenance of these settlements as well as any involvement in settlement activities constitute crimes according to international law. A major brand like Adidas should not link its good reputation to these activities. 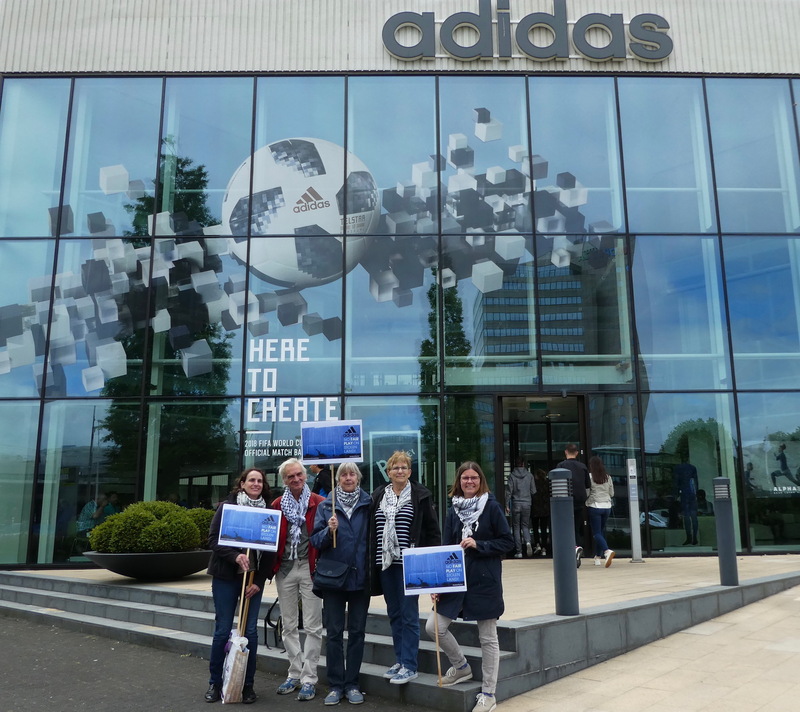 At Adidas’ Amsterdam Office the docP delegation handed an international petition with over 16,000 signatures, together with a copy of an open letter signed by over 130 Palestinian football clubs and a letter of docP over to two representatives of Adidas. Both letters call for an immediate ending of sponsoring of the IFA by Adidas. The delegation was well received at Amsterdam Adidas office. Both delegations listened attentively to each other’s statements and points of view. The concerns and grievances expressed by docP and the worldwide BDS Movement will be forwarded to the head office of Adidas in Germany and a response from them is expected.